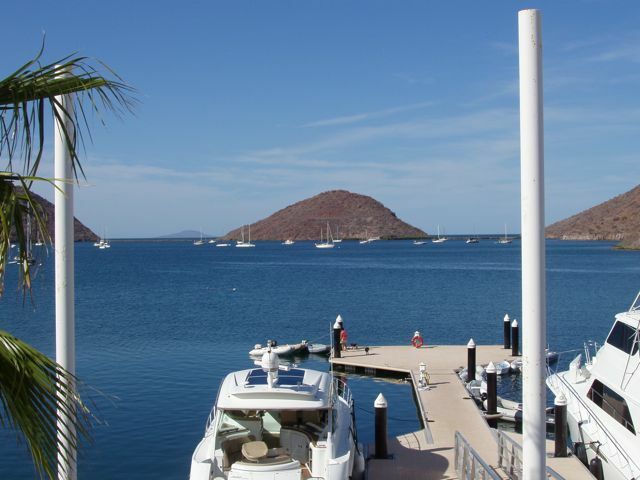 What a lovely marina! What lovely people! What a confused system for payment! Jeez, we stayed there for four days and never even found the office for the marina in which we stayed for three of the days, and since we left on Good Friday, the office for the buoy system was closed, too. Ah, nothing like cruising in a Catholic country! 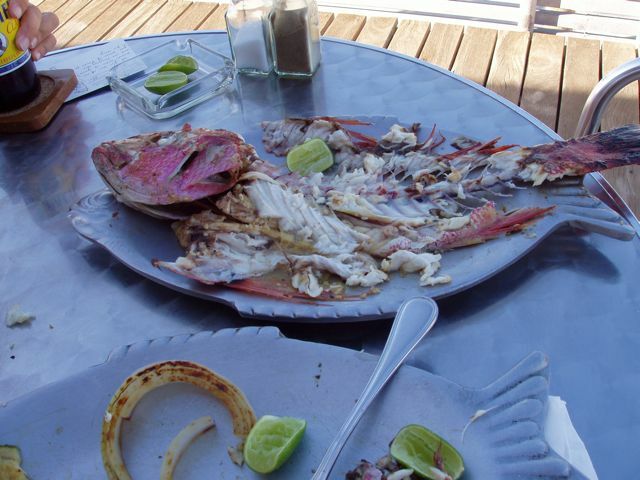 It is from Puerto Escondido that we lost our last group of guests. We anchored in The Ellipse, a well-named small marina with no mooring buoys, so everyone was lying to short-scope anchors in a poor-holding bottom. It was a recipe for collisions, and we finally could take no more and moved to the mooring buoys. Although a greater distance to travel by dinghy, it was much more secure. The Ellipse, and indeed it was. These vessels are on anchors with very short chains, so they can be easily moved by wind and waves. Since they're so close to one another, collisions were likely and fairly common. 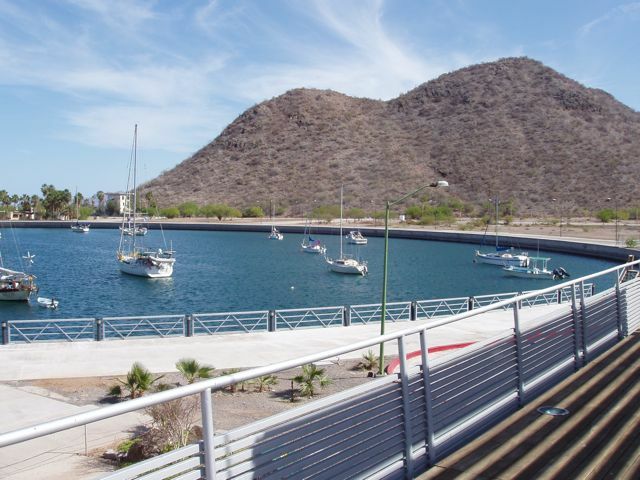 The stairs at right access the dinghy dock. 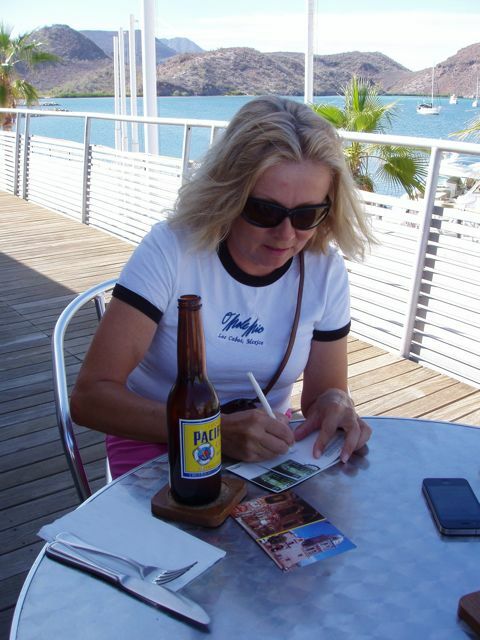 Conni writes post cared, inspired, no doubt, by her Pacifico. She does love Pacifico! Mexicans have poetic and descriptive names for many features. We're looking northward through two low area (not-navigable) that the locals call, "Las Dos Ventanas" or "The Two Windows". Wings is on one of the buoys in the center of the photo, and our dinghy is the grey one at the dock end. Lovely Conni returning from a laundry chore toward our table with its beer and postcards. The Ellipse is behind her. The restaurant is the source of Wifi we used extensively. Antes. "Before". 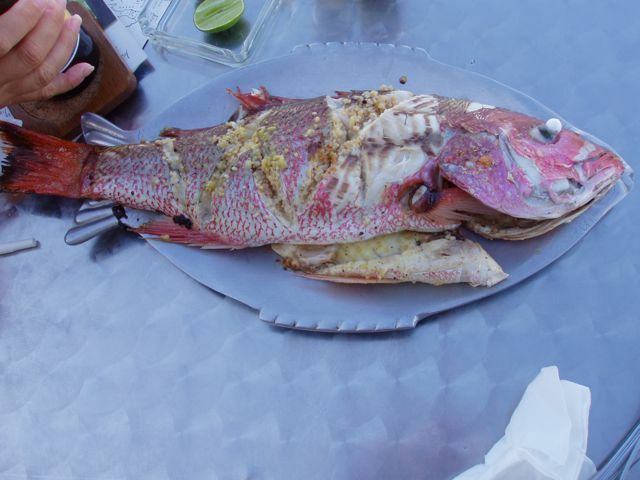 We think that this is a Red Snapper, simply prepared with salt, pepper, onion, and garlic, and then baked. After gutting and scaling it, the cook sliced these gashes and spooned the butter and spices. Despues. "After". The manager of the restaurant, with whom we had struck a friendship since we were some of the few who tried to speak Spanish, gave us "right of first refusal" on this fish. He proudly showed it to us, just pulled from the sea and lying on a plate he was holding as he described his preparation. It looked so fresh and his preparation seemed so good, that we decided to eat at the restaurant. A couple of beers each, a whole fish for the two of us, and a full salad and meal: US$25.